Since Berlin, the 3rd edition of FuturPera has just been announced. 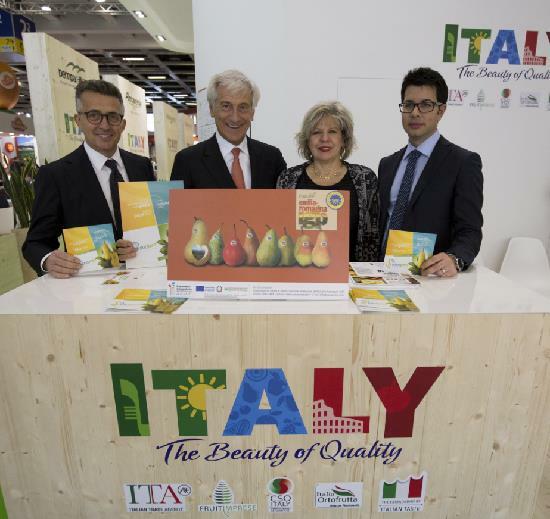 The only European trade show dedicated to the entire "Pear" sector. On the ITALY stand, the press conference held underlined the significant growth recorded by the FuturPera event, which reflects the huge interest of the sector. The 2nd edition showed a 30% increase in the number of visitors compared to the original edition. With more than 10,000 visitors and around 120 exhibitors specializing in all sectors of the supply chain, not only from Italy, but also from other European countries, including Holland and Germany. The 3rd edition of Futurpera will be held in Ferrara from 28 to 30 November 2019. From left to right: Paolo Govoni (President of the Chambre de Commerce of Ferrara), Paolo Bruni (President of CSO Italy), Simona Caselli (Assessor of Agriculture, Emilia-Romagna Region), Stefano Calderoni (President of FuturPera).